Walk to School Day Thursday morning. 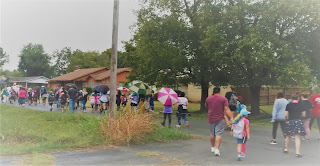 Sallisaw School students and their parents participated in the school system’s first Walk to School Day on Oct. 4. Although this was the first Walk to School for Sallisaw Schools, it was the 21st national and annual Walk or Bike to School Day, said Tricia Wall, TSET Healthy Living Program Wellness Coordinator. Wall worked with the County Health Improvement Organization (CHIO), Sallisaw School Superintendent Scott Farmer and Liberty and Eastside Elementary School Principals Toni Jasna and Chad Jasna, respectively, to coordinate and actualize Sallisaw‘s first Walk to School Day. Wall marveled over the turn out. Wall said regular physical activity not only helps reduce childhood obesity, it helps strengthen kids’ brains, boost the immune system, improve sleep and reduce stress. Aside from improved physical and mental health, active students also gain improved self-confidence and self-esteem.